Meteorite Shower Rains on Russia after Air Defense broke it up? A series of explosions in the skies of Russia’s Urals region, reportedly caused by a meteorite shower, has sparked panic in three major cities. Witnesses said that houses shuddered, windows were blown out and cellphones have stopped working. ­Please follow RT’s live updates on the Urals meteorite explosion. Check out eyewitness accounts of the meteorite phenomenon, handpicked by RT. According to unconfirmed reports, the meteorite was intercepted by an air defense unit at the Urzhumka settlement near Chelyabinsk. A missile salvo reportedly blew the meteorite to pieces at an altitude of 20 kilometers. Over 400 people sought medical attention as a result of the incident, according to the Russian Interior Ministry. No serious injuries have been reported, with most of the injuries caused by broken glass and minor concussions. 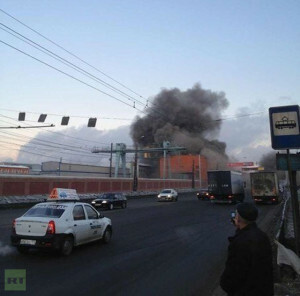 Lifenews tabloid said that at least one piece of the fallen object caused damage on the ground in Chelyabinsk. According to preliminary reports, it crashed into a wall near a zinc factory, disrupting the city’s Internet and mobile service.